Husky growling can be alarming to an owner who does not realize what the cause of it is. If your Husky is always growling in certain situations, you may need to examine this behaviour more closely in order to determine the root of the problem. In some cases, it is caused by a serious underlying issue, while in other cases it’s nothing of concern. Growling is a completely natural instinct in all dogs. It’s a sign of fearful or assertive behaviour, when a dog perceives either a person or thing as a threat. It is also used during play which is often observed among puppies in litters. Before you try to stop your Husky’s growling, you should determine whether he is exhibiting “play growling” or truly aggressive growling. You can tell the difference between these two types of growling by the way it sounds and your dog’s body language. If your Husky is play growling, his body will remain relaxed, with his lips loose, teeth covered, and no eye contact. Hackles will not be raised and the tail remains in typical play position. The growling has shorter syllables while the pitch will go up and down quickly. This type of growling should not raise any concerns, although it can be undesirable especially with visitors or children. Discouraging this type of growling may be ideal. If your Husky is doing an aggressive growl, he will stare you straight in the eye, with a long and steady, low growl. His body will be tense and the message should be clear. He is warning you that if you come any closer, he will attack. Obviously, this kind of growling is of bigger concern and is the type that can eventually lead to aggression issues if not dealt with. When Is Husky Growling A Real Problem? What does he do if you take his food away? What does he do if you try grooming him? Does he let you? What if you try taking his toys away? What does he do if you move him from his favourite spot? Or interrupt him in the middle of his favourite activity? If your Husky growls at you every time if you do the above things, then there is a problem. 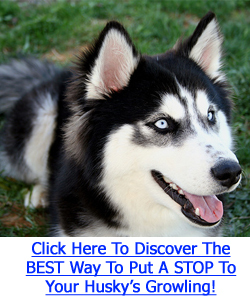 Click Here To Discover How To STOP Your Husky’s Growling Problem For GOOD! Husky growling is one of the behaviors that is easier to prevent than it is to correct. Socialization is the key factor to preventing growling in any dog. However, if your Husky already has growling problems, it’s never too late to socialize him. You will need to work on socializing him with other dogs, animals, and people. At first, he may be uncomfortable around other animals, strangers, or children which may cause him to growl. If that’s the case, you may want to use a muzzle in the beginning. Gradually expose him to new places, animals, other dogs, and new people. It’s best to first socialize your dog around other dogs that are non-aggressive, and children who are calm rather than rambunctious. It will take a while for him to adapt, especially if he’s older, so have patience. Once your Husky stops growling at people or other dogs and animals, you can remove the muzzle. While socialization training your Husky, you will always want to say “No!” when he growls. Always make it clear that it’s unacceptable behaviour. You also do not want to give in to his demands – maintain an alpha position. Go through doorways before him, eat your meals before he gets fed, and do not allow him to sleep in your bed. If you allow him to get his way at home, he will see himself as the leader and that will only exacerbate the growling problem. Never, ever hit a dog that is growling. It will make the situation worse and even cause aggression. If your Husky continues to growl, even with socialization training, that could be a sign of a more serious, underlying issue that you may need a professional to handle. It is highly recommended that you contact a professional trainer if you cannot handle your Husky growling problem yourself.